It’s another skinny batter dip. I will never post a skinny dessert recipe on this blog unless it TASTES LIKE DESSERT! I did a lot of “skinny” dessert testing in December, because I wanted to have some great recipes that would fit in with your (and my) 2014 healthy eating resolutions. And I was super disappointed to discover that there are a lot of great looking skinny dessert recipes out there that do not taste anything like dessert… or like food. In the end, I found an oatmeal recipe I really liked (to be posted soon!) 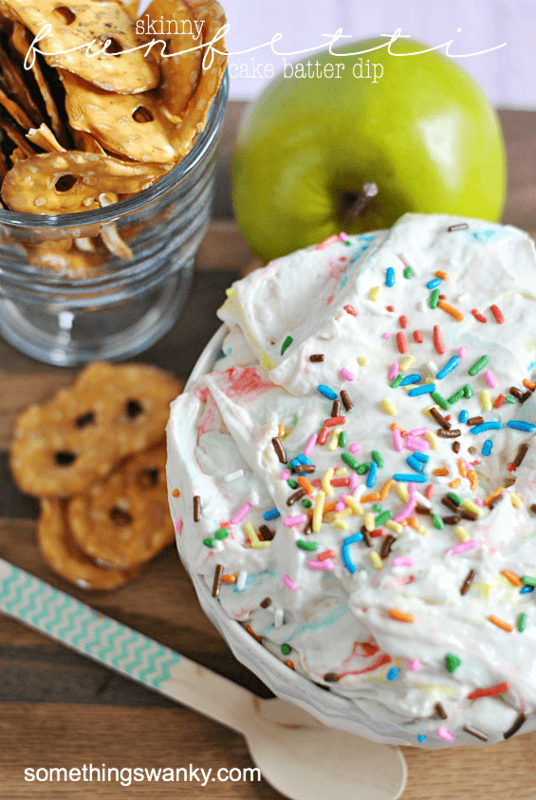 and this Skinny Funfetti Cake Batter Dip. And you know it’s good, because it passed the I-have-a-ridiculous-sweet-tooth test! I modified the recipe I’m sharing today from Six Sisters Stuff, but I’ve also seen a version on The Domestic Rebel! Truth be told, I was a little underwhelmed with the dip immediately after making it. But after it chilled overnight in my refrigerator, it was seriously unbelievable! I couldn’t believe what a difference the chill time made. Instead of tasting like a bunch of separate ingredients (which still tasted okay), it actually tasted like CAKE BATTER and was absolutely delicious!! As you can see in the photos, the only downside to overnight chilling is that the sprinkles bleed quite a bit. I solved this (to my satisfaction, anyway) by simply adding more sprinkles after the dip was poured into its serving bowl. You could also easily avoid this pitfall by using a white cake mix in place of the Funfetti cake mix, and then adding sprinkles just before serving. In a large bowl, whisk together the Greek yogurt and the cool whip until completely incorporated. Whisk in the cake mix in 1/4 cup increments, whisking in between each addition. As the mixture becomes stiff, add 1/4 cup of milk at a time (alternately with the cake mix) to thin it out to a desired consistency*. STRONGLY SUGGEST chilling the dip over night (covered). *I used 1 cup, but you may prefer your dip to be thicker than I did, which I why I don't recommend pouring in the entire cup of milk from the start. YUM! My kids would be all over this. Pinning now! I know, skinny needs to be good or yuck! And not only is this fabulous but it’s GORGEOUS! I agree. Dessert must taste like dessert–skinny or not. This really looks amazing. I loved the pb yogurt dip you made. I eat it all the time, either as a dip or by the spoonful. I can’t wait to give this a whirl. Happy New Year! Pinned. I’m totally with you. 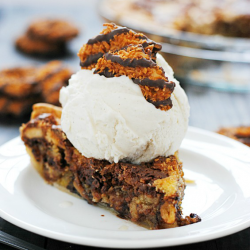 To be honest, when I see “skinny desserts”, I don’t even bother because, um hello?! So I’m totally taking your word on this and going to try it out. I do love all things cake batter! And this?? Going crazy over here. Pinning! I just made this today with my daughter and it’s great! So happy to find a skinny recipe that tastes as good as the real stuff! Love this recipe. 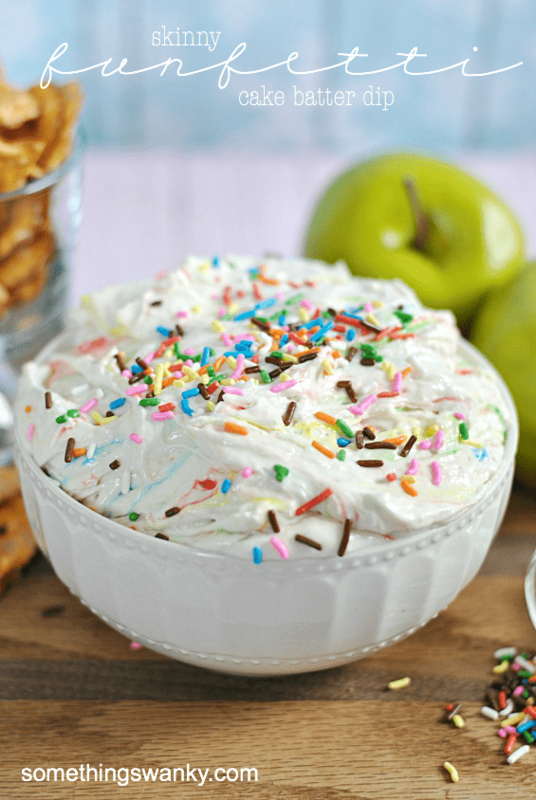 I love the idea of using a cake mix to flavor the dip. Can’t wait to try it. Do you have any idea what this would taste like with gluten free cake mix? I would hate to spend the money on a mix and it doesn’t work well with the other ingredients. Thanks! holy moly this stuff is amaaaaaaaaaaaaazing. is it a problem that i’m just eating it off a spoon?? this recipe is amazing made it yesterday however I have been doing a calorie counter to keep track of all my daily intake and was wondering how many grams of sugar are in this? the rest of the nutritional facts are on there just not the sugar if you could please list that I would really appreciate it. Do you have any other suggestions on what to serve this with? Would any other fruits besides apples taste good with it? I plan on making this for a friend’s birthday next week and I want to give her a lot of options. Thanks! This looks great! I just made this. I used powdered peanut butter instead. Delicious!